Or something like that was the message Monday from Kobe Bryant before the Bulls played the Lakers in the Martin Luther King, Jr. Day game at the United Center. Bryant, the Lakers’ great legend, is traveling with the team as he recovers from a fracture in his knee. He suffered the injury a few games after returning from Achilles surgery earlier this season. Bryant hopes to return to play in February. With Bryant and Derrick Rose featured, TNT was scheduled to televise the game. But with both in suits for the game, the national broadcast moved on. But Bryant met with reporters before the game and addressed a number of topics, including the growing emphasis in the NBA on curtailing rough play. Bryant’s message is to relax a little. It’s basketball, not checkers. Bryant, the Lakers’ great legend, is traveling with the team as he recovers from a fracture in his knee. “It’s more of a finesse game,” said Bryant. “It’s more small ball, which personally I don’t really care much for. I like kind of the smash mouth, old school basketball because that’s what I grew up watching. I also think it’s much, much less physical. Some of the flagrant fouls I see called nowadays makes me nauseous. You can’t touch a guy without it being a flagrant foul. Truly, a player Tom Thibodeau would love. 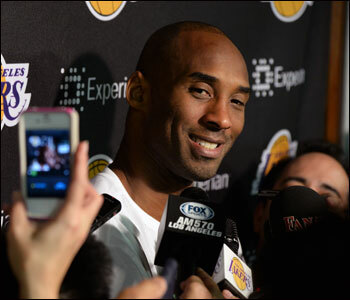 Bryant is a Laker for life with a two-year contract extension that begins next season. It seems unlikely the Lakers will be serious contenders in that time, though Bryant seems now to have settled into an elder statesman role in his NBA life and looked at some of the changes he’s seen in a career that many believe will have him regarded as one of the top 10 players in league history. Bryant was one of the pioneers of the direct high school to the pros jump and he says he’d like to see it return to that. “I don’t really look at it from that perspective of if it was good or bad for the game,” said Bryant. “The reality is a lot of players who have come out of (high) school and if you do the numbers and look at the count, you’ll probably see players who came out of high school who were much more successful on average than players who went to college for a year or two years and left early. It seems like the system isn’t really teaching players anything when you go to college. You go to college, you play, you showcase and you come to the pros. That’s always been the big argument. As a player, you have to go to college, develop your skills, so forth and so on, and then come to the league. We kind of got sold on that dream a little bit. Fortunately, I didn’t really listen much to it. Neither did KG. Neither did LeBron. I think that worked out pretty well for all three of us. Bryant said he hasn’t spoken yet with Derrick Rose but hoped to see him at the game. And Bryant, who says he has no doubt he’ll be a high level player again. But not to play for a third Olympic gold medal in the 2016 Olympics. Bryant has two with USA Basketball and earlier in the evening Thibodeau, a USA assistant coach, joked he might try to persuade Bryant to try again.